You may not know this about Heidi Michele Designs but hats and earrings aren't our only forte, Heidi Michele is the designer for most of the National Park's pins and patches. About 75% of the parks are currently selling one or more of Heidi's designs. 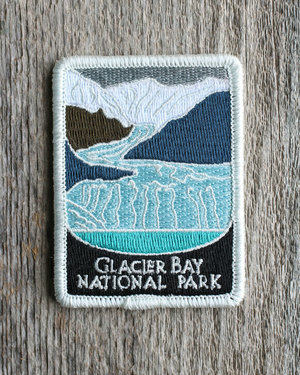 If you've been to a U.S. National Park visitor center chances are you've seen or even purchased a pin or patch designed by Heidi. With today's current events we'd like to pay tribute to our parks and give fellow nature lovers ways they can ensure these beautiful lands stay protected. We want to remind the American people why National Parks were, as American novelist Wallace Stegners claims, "the best idea we've ever had". The sustained natural beauty amidst an ever growing and expanding civilization has been a source of inspiration for many creatives and conservationists, to the likes of Ralph Waldo Emerson, Henry David Thoreau, and John Muir. The parks have always been a place of refuge from society, a place to get back in touch with our roots, and to marvel at Mother Natures greatest works of art. "Come to the woods, for here is rest," wrote Muir referring to Yosemite, "There is no repose like that of the green deep woods. Here grow the wallflower and the violet. The squirrel will come and sit upon your knee, the logcock will wake you in the morning. Sleep in forgetfulness of all ill. Of all the upness accessible to mortals, there is no upness comparable to the mountains." But can we rest assured that these preserved lands will remain so? With the growing population and boom of the cheap natural gas market they may be in danger. While the "anti-parks caucus" looks to have more federal land opened up to more drilling and fracking, former President Theodore Roosevelt is turning over in his grave. According to Oliver Milmann, writer for The Guardian, "An analysis by the Center for American Progress (CAP) has found that between January 2013 and March 2016, rightwing members of Congress filed at least 44 bills or amendments designed to undermine or water down protections for national parks." Along with the encroaching mining and drilling industry, the NPS is experiencing substantial cutbacks on federal funding. A 2017 memorandum by President Trump aims to halt most federal hiring. Rangers are working with crumbling infrastructure and are significantly understaffed. They're finding it more and more challenging to protect, maintain, and meet the demands of the record breaking numbers of visitors flowing in and out of the parks. Have some spare time? Do you live near a National Park? National Parks are often times taking in volunteers. Do it as a solo mission or start volunteer groups with your friends and family to help spear-head some of the projects that parks are struggling to finish. American citizens are involved in politics now more than ever. It's up to us to keep this momentum going and continue to be the voice for our federal lands. Visit the National Park Advocacy page to learn about what pressing issues the parks are facing and how you can help by voting or contacting your state representative. For those new to the world of politics and political action or if you just want to make it easier on yourself we recommend the Countable app. Countable gives you the ability to review upcoming legislation before the US Congress, email your representatives and express your support or opposition of the bill. Attending your state town hall meetings on subjects regarding our federal can have a huge impact on the decision making of your representatives. Here you can have your voice heard by speaking directly to them. Remember, this a democracy, the government works for us. So, what is important to us? In the future, we may hopefully see solar or other more sustainable sources of energy start to have a larger impact and reach in our country. However, we cannot overlook the current economic dependency on oil. We also cannot overlook the growing boom of the outdoor industry. But looking outside of finances and politics, do we really care so little about our past presidents and parents goals and wishes? Do we care so little about the special places in our country? We want our children's children to be able to look on in wonder at the towering majesty of Yosemite, or the vast beauty of Yellowstone. We grow, when we play in Mother Nature. She teaches us more about ourselves. So instead of saying we must make room for more factories, maybe we can start looking forward to making more room for nature, and continue to coexist, instead of walking backwards to tread on the dreams and goals of millions just to add more money to an industry that will, without a doubt, come to an end.